“That doesn't have anything to do with the president or the first lady," White House press secretary Sarah Huckabee Sanders told reporters on Thursday night, when asked about the story in the Journal. Wolkoff, who is a friend of first lady Melania Trump, did not respond to a request for comment. Wolkoff’s firm, WIS Media Partners, was the inauguration’s highest-paid contractor, according to the committee’s tax filing. Wolkoff was scrutinized in media accounts this year because the firm received nearly $26 million. Most of that of the money was passed on to subcontractors, according to a person familiar with the spending. 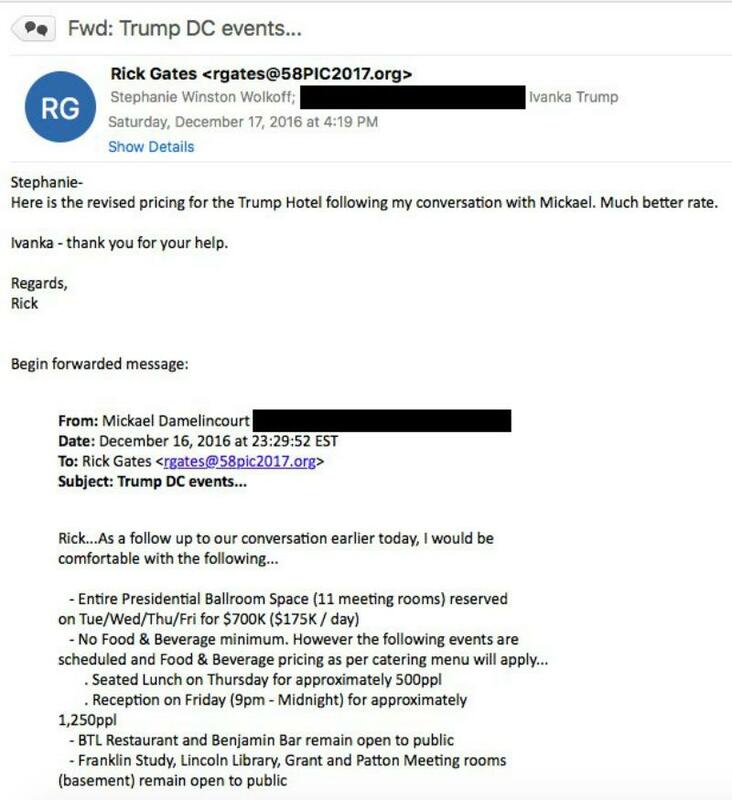 It is possible that payments to the Trump hotel were included in that sum. The day before Trump’s swearing in, the inaugural committee hosted a Leadership Luncheon in the hotel’s Presidential Ballroom, featuring his cabinet nominees and major donors. “This is a gorgeous room,” the president-elect told the crowd. “A total genius must have built this place.” And the night of the inauguration itself, Trump’s family and close allies such as Sean Hannity celebrated into the early morning at an exclusive after-party in the Trump hotel’s grand lobby. Thousands of red, white and blue balloons were released from the rafters. In a separate episode this year, a U.S. lobbyist pleaded guilty to helping a Ukrainian businessman and member of Parliament buy tickets to the inauguration, in violation of rules barring the committee from taking foreign money. The inaugural committee was not accused of wrongdoing in that case. Alice Wilder provided additional research assistance for this story. 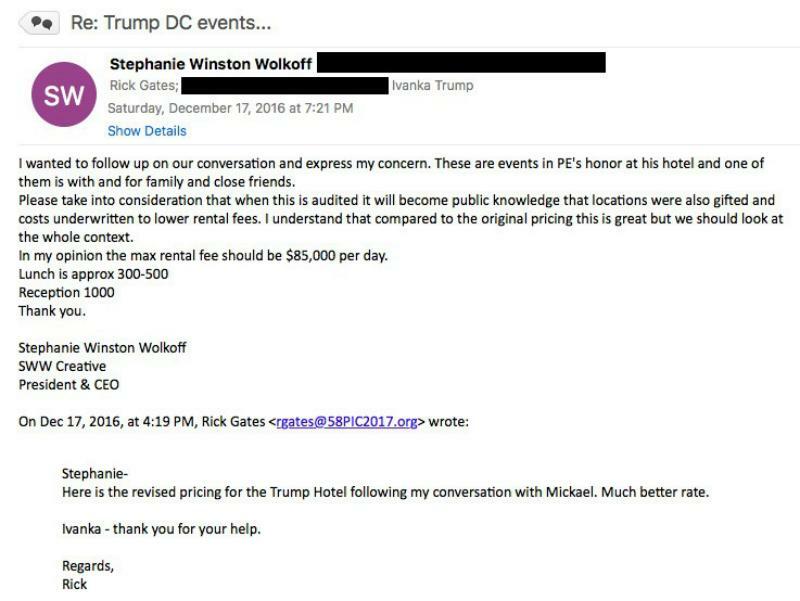 Do you have information about Trump’s inaugural or the Trump Organization? 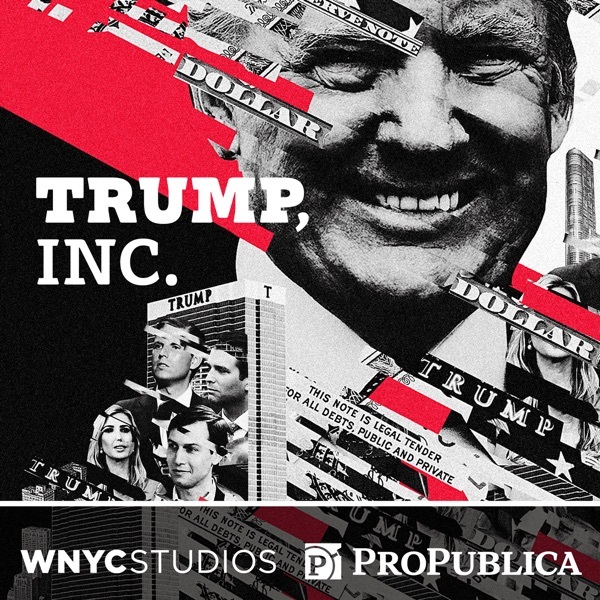 Email Ilya at imarritz@wnyc.org or via Signal at 646-662-1249 and Justin at justin@ProPublica.org or via Signal at 774-826-6240.